As far as my bird watching experience goes, the most memorable experience I’ve had is being up close and personal with a falcon while visiting the United States Air Force Academy. Then, while aiding in a story on birding weekends in Great Bend for KANSAS! magazine, I was intrigued to learn what prime real estate Kansas has for witnessing various migratory birds, but none more special then the bald eagle. In Kansas there are handful of locations that highlight this symbolic bird in its natural habitat. These locations of preserved land are poised to welcome a bounty of wildlife, but when something so iconic as the bald eagle can be seen in such close proximity, it’s almost an homage to this great country and our fortune of seeing them in the Midwest. Here are a few locations to visit from now through April to capture a glimpse of these beautiful creatures. Bald Eagles are just one of the many migratory waterfowl that frequent the Flint Hills National Wildlife Refuge. 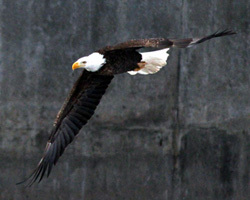 During the winter, bald eagles are known to be very common in the area, unlike the rest of the year. The Bald Eagle is one of 90 species that nest in the refuge, creating rewarding experiences for bird watchers and photographers. The beautiful Flint Hills landscape also makes for an exclusive experience among Kansas’ tallgrass prairie and big bluestem grass. Though eagles have been nesting near Clinton Lake since the turn of the century, a nest was first documented in 1989 in the Deer Creek Arm of the reservoir. The wooded surroundings and limestone bluffs of Clinton Lake provide many vantage points for seeing the eagles swoop over the water and catch prey. Annual Eagle Day celebrations welcome bird watchers and photographers to take an interest in the remarkable bird. Pick up maps, brochures and a Backwood Nature Trail guides from the Corps of Engineers Information Center, just north of the damn. A pair of bald eagles built a nest in the Fort Riley Multi-purpose Range Complex in 2004, and they have continued to return every year since. Protecting the area and birds, the space is closed to military training during the winter, increasing the opportunity to watch the birds in their natural habitat. Unique to this set of birds, the male eagle was noted to be an eagle branded from the Clinton Lake nest. Every January the lake celebrates the eagles with an Eagle Day. River Pond State Park below the dam is said to be the best location for viewing bald eagles. During the mid-winter eagles will spend time fishing the river pond and rest in the tall trees of Eagles Island. Additional locations for viewing Eagles are the Kansas State University Range Research Unit (2 miles southwest of the dam) and east of the lake (west of K-13) at Prairie Parkway. Among annual eagle events in the winter are many education opportunities to learn more about bald eagles from conservationists and the Army Corps of Engineers. On February 4 the Chaplin Nature Center, in Arkansas City, will host an eagle watch. -Photos were taken by Mike Rodriquez and Geary County Convention and Visitors Bureau.